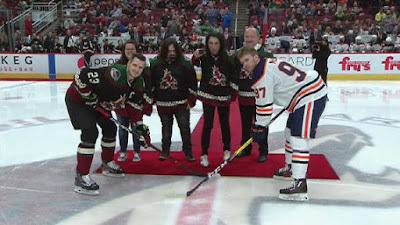 The NHL is streaming video of Alice Cooper performing the ceremonial puck drop prior to the Arizona Coyotes hosting the Edmonton Oilers at the Gila River Arena in Glendale, AZ on March 16. Arriving at center ice to the tune of his 1973 classic, “No More Mr. Nice Guy”, the rocker was joined by his son, Dash, for the occasion, as well as a Coyotes staff member and a longtime season ticket holder. The Phoenix native has been a supporter of his local professional hockey team since they first arrived in the city in 1996; originally known as the Phoenix Coyotes, they moved into the arena in Glendale in 2003, years before undergoing an ownership and name change to become the Arizona Coyotes in 2014.
Cooper has a busy live schedule set for 2019: he’ll play a series of US west coast dates with The Hollywood Vampires in May – including a stop in nearby Scottsdale, AZ – before launching his all-new "Ol' Black Eyes Is Back" stage show with US dates beginning in July.